Forex market is affected by the global economy, and knowledge of almost all developed economies is required to conduct the fundamental analysis for currency pairs traded in the forex. A trader cannot be a master of all economies, and he/she does not require to be. Overviews of the economies that can affect the value of a currency are need to be studied to conduct the fundamental analysis for that currency. The domestic economy and trade partners' economies need to be studied by the traders to conduct the fundamental analysis for currency market. Following table contains the economic data of an economy that currency traders need to concentrate on. 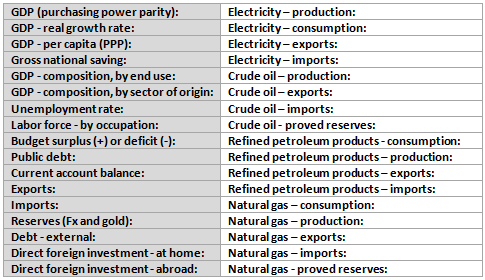 First column of the table contains the basic economic data, and the second column of the table contains the energy sector data. Basic economic data explain the structure of the economy, its strengths and weakness. Almost all traders know the importance of economic indicators that are released every month. The basic information about an economy helps to understand the importance of the released economic indicators every month. For example, if the service sector of an economy composes 73% of its GDP, then traders can easily understand the importance of service PMI economic indicator on the corresponding economy. The energy sector data explains the production of the energy, consumption of the energy, export and import of the energy, and reserves of the energy. If an economy is one of the exporter of a certain energy commodity, the price of that commodity can significantly affect the value of the currency of that economy. This set of data can be obtained from "The World Factbook of CIA". The World Factbook of CIA actually saves plenty of time, and let the traders be introduced with an economy very easily. Traders should have the data from the latest addition of The World Factbook of CIA. Traders should also learn the top ten or five products exported and imported by an economy or country. They also need to learn the top ten or five trading partners of the country. When the price of exported products by an economy increases, the value of the currency of that economy also go up and vice versa, on the other hand, if the price of the imported products by an economy increases , the value of the currency of that economy decreases and vice versa. Dear traders, if you want to join the discussion with other traders, you can drop a comment below. You can also subscribe my blog to receive the updates, entering your email address into the subscription box. Thank you.